Rise of Destiny is a Booster Pack in the Yu-Gi-Oh! Official Card Game (OCG) and Yu-Gi-Oh! Trading Card Game (TCG). It is the second Booster Pack in the OCG Series 4. The set has been released in the TCG in English, French, German, Italian, Portuguese and Spanish and in the OCG in Japanese, Asian-English and Korean. Rise of Destiny was the first set to have a Sneak Preview event, although it did not issue any participation cards. It was also the last mainstream Booster Pack to feature Yami Yugi on the cover. In the TCG, this set was also released in the Rise of Destiny: Special Edition. This is one of the four Booster Packs combined into Dark Revelation Volume 3. Expand the fantasy with the ultimate creations, and expand your game with more LV monsters and deadly Machines. The 13th booster contains "The Creator" which can bring your monsters back from the Graveyard, and marks the return of the Harpie Ladies with powerful new support cards. 9 cards per pack with 60 cards to collect. Rise of Destiny continues the new alternate Ultimate Rare foil card, find all 25! In the Japanese version, each pack contained 5 cards and each box contained 30 packs. In the TCG and Asian-English version, each pack contained 9 cards and each box contained 24 packs. In the Korean version, each pack contained 5 cards. 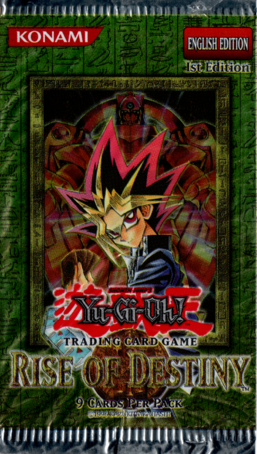 Yami Yugi's appearance on the cover of this product is taken from the title page for Yu-Gi-Oh! Duelist Duel 175. This page was last edited on 8 April 2019, at 18:15.